CommUnity is hiring a full-time Mobile Crisis Follow-Up Counselor to be a part of the Mobile Crisis Outreach Team. The counselor will be responsible for following up via phone with a large volume of Mobile Crisis clients, as well as being available for in-person dispatch on Mobile Crisis calls. The results of the 2018 Iowa Youth Survey have recently come out, and we are seeing that the rate of thought of suicide in young people continues to rise. Nationally, surveys show that among teenagers, 3 out of 20 students has thought about suicide in the last year. 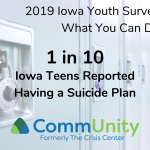 The results of the 2018 Iowa Youth Survey show that a high number of those young people in Iowa have even gone so far as to make a plan for suicide.